The latest on Metop-B from the Main Control Room at ESA’s Operations Centre in Darmstadt. All our systems are green! The ongoing post-launch tests & check-outs are proceding as planned. The Soyuz-Fregat launcher did a fantastic job, injecting Metop-B into its orbit at a precision of 3km and within 2 millidegrees of planned inclination. Currently, Metop-B is at around 790 km altitude, moving toward the 817 km routine polar orbit. As planned, we have been checking spacecraft attitude, data handling, telecom links, software, back-up systems, solar array operation, power and temperatures. All look very well and, thus, ‘nominal’. 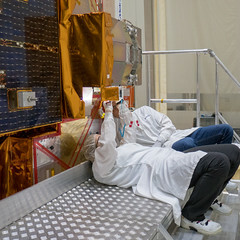 We will do further tests and will soon start switching on the scientific instruments of the weather satellite.